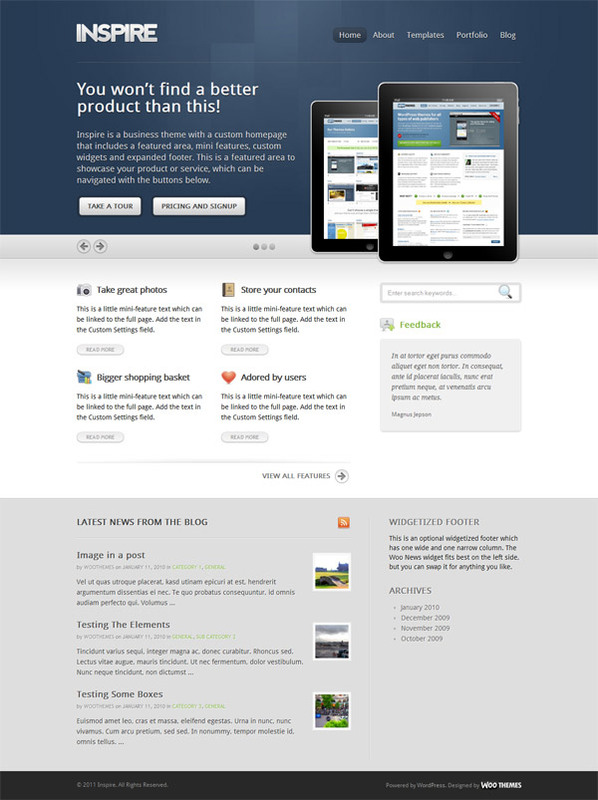 Inspire is a highly functional theme that has a custom homepage with a featured area powered by jQuery, and lovely mini-featured area. This along with the included portfolio page template makes it perfect to use for your business to show off your work or products. The theme comes with a custom home page featured area to showcase your work or products with style, all powered by jQuery. You get a custom home page layout with Mini-features area, and option to insert any page above/below mini-features area. An optional integrated portfolio section to show off your work, which utilizies jQuery prettyPhoto script for added effect. Inspire takes full advantage of the new custom post types functionality than came with WordPress 3.0, so adding slides, mini-features and portfolio posts is dead easy. Custom Woo Widgets for use in the sidebar and in the widgetized footer: Flickr, Ads Widget, Search, News, Tabs, Feedback, Blog Author Info and Twitter. And 10 alternate background to choose from plus options to set your own background color, add background image and set link color. Also includes new Google Font replacement using Droid font.